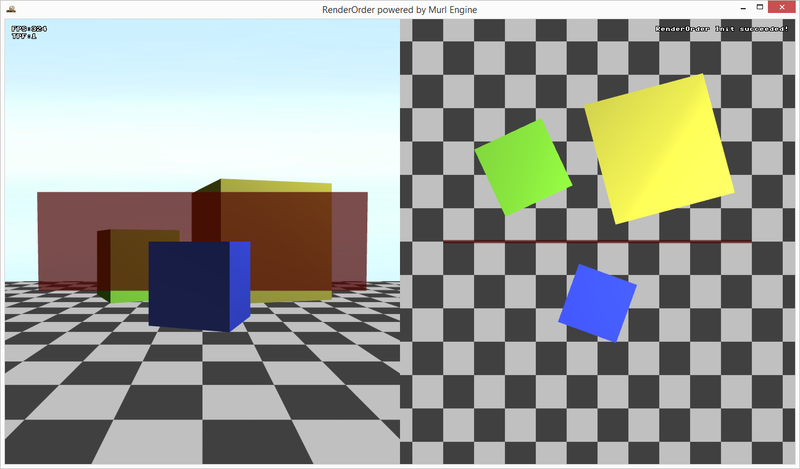 A new tutorial is available which explains the exact sequence in which the rendering occurs. You can find the Tutorial #14: Render Order in chapter one of the tutorials section. Visible surface determination is usually done with the Z-buffer technique (also known as depth buffering). In this case the drawing order of the objects is irrelevant for the render result. However, the Z-buffer technique only works with opaque faces but not with transparent faces. Transparent, overlapping faces have to be drawn in the correct order sorted from back to front. This is because the drawing order has a significant impact to the final compound color. Thus it is often wise to render the opaque geometries at first with Z-buffering enabled and the transparent geometries afterwards accessing the Z-buffer in read-only mode. Also for overlays, HUDs and various effects the render order often plays a vital role. This tutorial describes the exact sequence in which the rendering occurs and shows ways to control the render order.